Conditional Formatting is a powerful TrackVia feature that allows users to easily change the text and background colors of their records. Quickly identify records that meet any specified business criteria with only a few clicks. Being able to see records color-coded by Status. Quickly being able to identify currency fields above or below a specified threshold. Easily call out overdue, or soon-to-be-due, items. Conditional formatting can be applied to standard grid views, Timeline | Calendar views, and Maps. To set up Conditional Formatting, navigate to the Toggle View Options dropdown on any custom View and select “Conditional Formatting”. Once launched, click “+ Add Rule” to configure the first rule to apply to this View. 1. Users are able to highlight an entire row of data, or just a specific field within the View. When highlighting, change the color of the text that will be displayed, the background, or both. 2. After applying a color scheme to the Rule, set the Conditions for when the rule should be applied to your View. 3. Click “Apply” and then “Save your rule, or add another to your view. Note: You can add multiple Rules to your View. Rules are applied in order, which can affect how the formatting is applied. For example, Rules will be applied in numeric order; Rule #1, followed by Rule #2, etc. 4. If the Conditional Formatting on a view only applies when certain criteria are met, note that it will be applied your grids in embedded child views and dashboards. 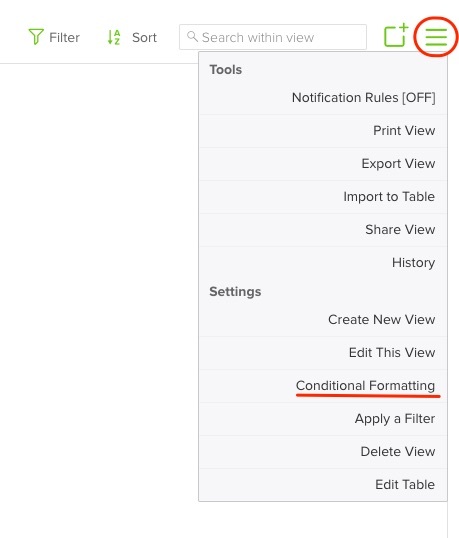 Please Note: Conditional Formatting is a View-only feature and does not have any impact on Forms.